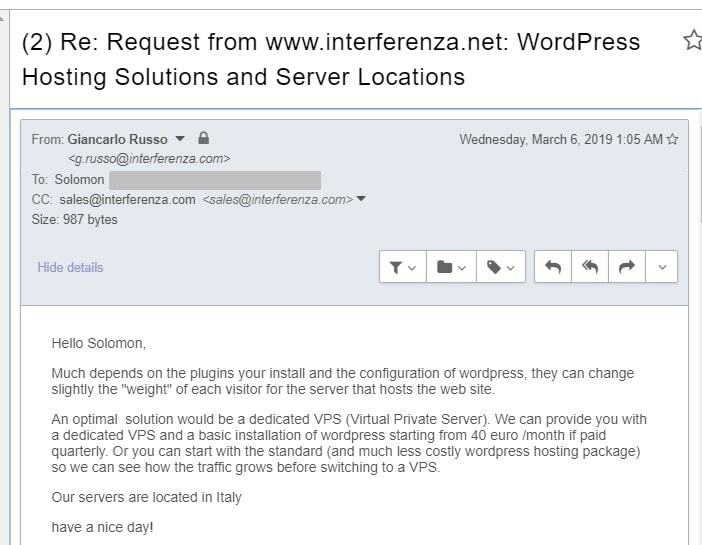 Interferenza Review 2019: Is Interferenza a Good Hosting? With more than 23 years in the industry, Interferenza is one of Italy’s most long-standing web hosting companies. It offers shared web hosting, dedicated servers, and virtual server solutions to businesses of all sizes in Italy and around the world. Italian hosting company Interferenza was established in 1995. With more 23 years in the hosting industry, this vendor’s commitment to offering quality web hosting solutions is reflected by the thousands of domains it hosts on its 84 servers. Interferenza is among the top 20 largest hosting companies in Italy by market share. It offers shared hosting, dedicated servers, and virtual server services to SMEs and large corporations. The Interferenza website looks a little outdated and still uses the out-of-favor Flash rather than the more modern HTML5 to display some of its content. The website is available in English and Italian. In addition, the hosting plans include daily backups and managed nightly backups of data, including web pages, email account messages, MySQL databases, and statistics. The Windows and Linux shared hosting solutions come in two packages. The entry-level simpleWeb package comes with 1 GB of disk space plus 5 email accounts with 100 MB storage each. The higher entryWeb shared hosting plan includes unlimited subdomains, 2 GB of disk space, 5 email accounts with 1 GB storage each, and 10 GB monthly traffic. Interferenza’s VPS solutions are hosted on Dell PowerEdge 2950 III Server and Dell PowerEdge R410 Server with a minimum specification of 2,26 GHz CPU, SAS disks, RAID 5 configuration, and dual NIC Gigabit port. This allows the vendor to offer superior and reliable hosting services. Interferenza’s hosting plans are pretty cheap, but they come with notable feature restrictions. Additional features such as extra bandwidth, CPUs, disk space, and memory are offered at additional cost. Plans are priced in euros and are offered on flexible monthly and annual billing cycles. Daily backups are free, but managed nightly backups cost extra. There is no free trial or refund policy, but you do get an uptime network guarantee. You can contact this company by telephone or an online form, but there is no email, live chat or ticketing system. The customer support desk is available 24/7/365, and I found the staff to be quite responsive. I received a reply to my exploratory email within four hours, which is fortunate because there is no knowledge base for self-support. While this vendor is a veteran of the web hosting industry, it doesn’t seem to have adequately invested in its hosting solutions. It suffers from a dated-looking website, some feature restrictions, and high charges for additional features. That said, the excellent customer support does a lot to uphold Interferenza’s reputation. Check out Italian host Interferenza. Wondering how Interferenza stacks up against other Web Hosting companies? Enter any other Web Hosting company and we will give you a side-by-side comparison.